Wearing contact lenses can be tough, especially when it leads to dry eyes and blepharitis - an eyelid inflammation that causes soreness. So any products which combat conditions like blepharitis are extremely welcome. Blephasol is the market leader in dealing with inflammation caused by dry eyes. Formulated by the technicians at SpectrumThea, Blephasol comes in lotion form which will immediately lessen the symptoms of blepharitis. Any lens wearers prone to dry eyes will benefit. 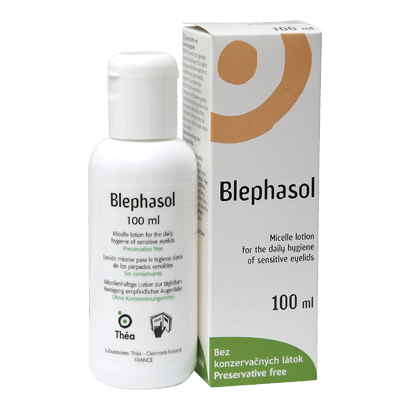 Blephasol is an effective treatment for blepharitis, an inflammatory condition affecting the eyelids of contact lens wearers. Dry eyes can be tough to deal with, but with Blephasol, anyone suffering from the awkward symptoms of Blepharitis can find instant and lasting relief. Make lens wearing comfortable again with this superb therapeutic product.